Recipe Post! Homemade Pizza in the Hizza! But, never minding the obesity risks, it can be pretty expensive to constantly order pizza, and with the delivery charge on top of the tip for the driver, sometimes it’s too much for my wallet to handle. So, like any cook worth his or her salt, that’s when it’s time to break out the pizza pans and get crackin’ in the kitchen! It’s not nearly as hard as they make it look. Truuuust me. In a mixing bowl, stir the sugar into the water. Sprinkle the yeast on top, let it stand for 10 minutes until foamy, then stir in thoroughly. Add the remaining ingredients EXCEPT the cornmeal and mix until you have a stiff dough. Turn dough ball out onto a heavily floured surface and knead until it is elastic and quite firm. Put dough back into bowl, sprinkle a little olive oil over the top and roll the dough until it’s thoroughly coated. Cover bowl with plastic wrap or a damp towel and place in a warm location free of drafts to let rise (about 2 hours; it should have more than doubled). Reserve the cornmeal for the next step. Cook the onions in the oil for 5 minutes, then add the rest of the ingredients and simmer for about 1/2 hour, stirring occasionally, until reduced and somewhat thickened. Let cool, then puree to smooth or slightly chunky consistency (your preference). 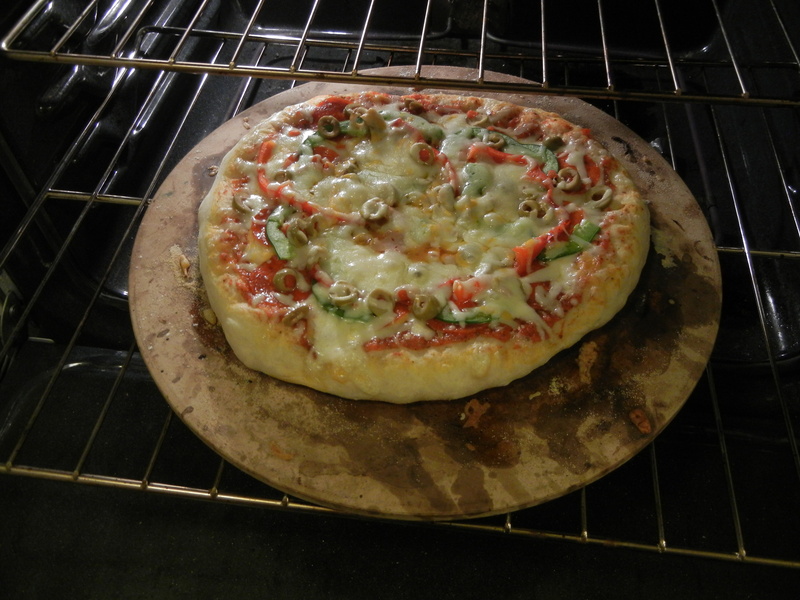 Preheat oven to 400 degrees F. Gently deflate the pizza dough and divide into 4 roughly equal portions (this will give you individual sized pizzas; if you want one large pizza, with a nice thick crust, use the whole thing, but make sure you have a pan large enough to hold it!). Roll each portion into a ball and sprinkle a small amount of bread flour over the tops of each. Work with one dough ball at a time; keep the others covered under a damp towel. 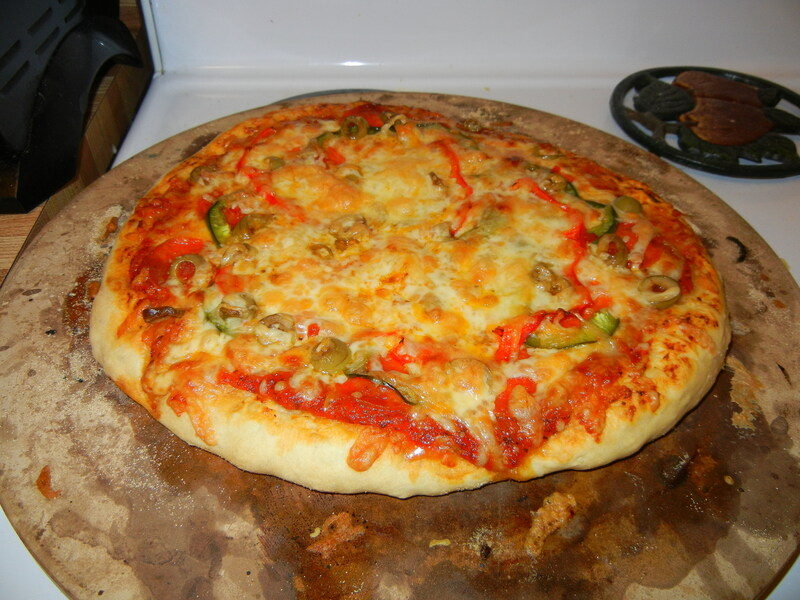 On a flat, clean surface, sprinkle a small amount of flour, and then flatten one dough ball into a rough oval shape using your hands or a rolling pin; pick up the oval and start gently stretching and kneading the dough with your hands until it is roughly the size and shape you want your pizza to be. Sprinkle some of the reserved cornmeal over the rolling surface and place the stretched dough over top. Continue to push and stretch the dough, creating a lip around the dough’s edge and repairing any tears or holes, until you are pleased with your dough base. 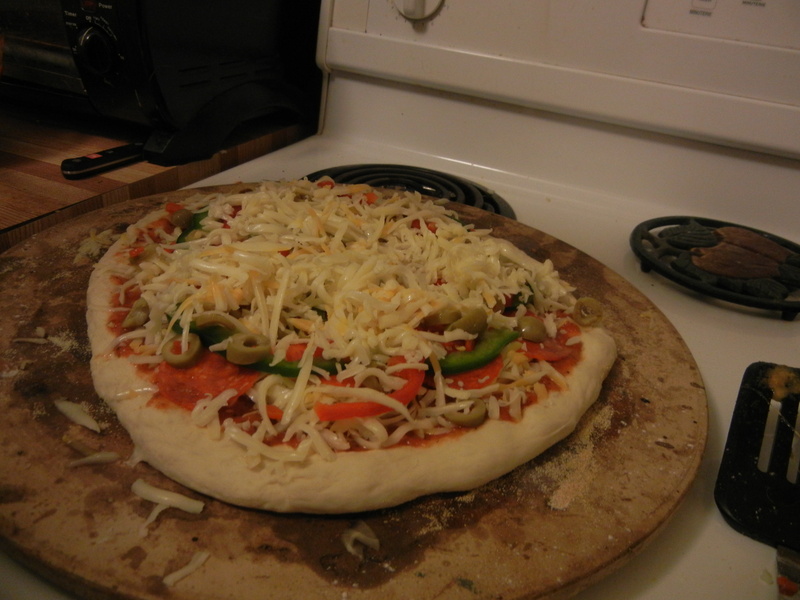 Move to a pre-heated pizza stone or pizza pan, and either start on your next dough ball or begin the next stage. 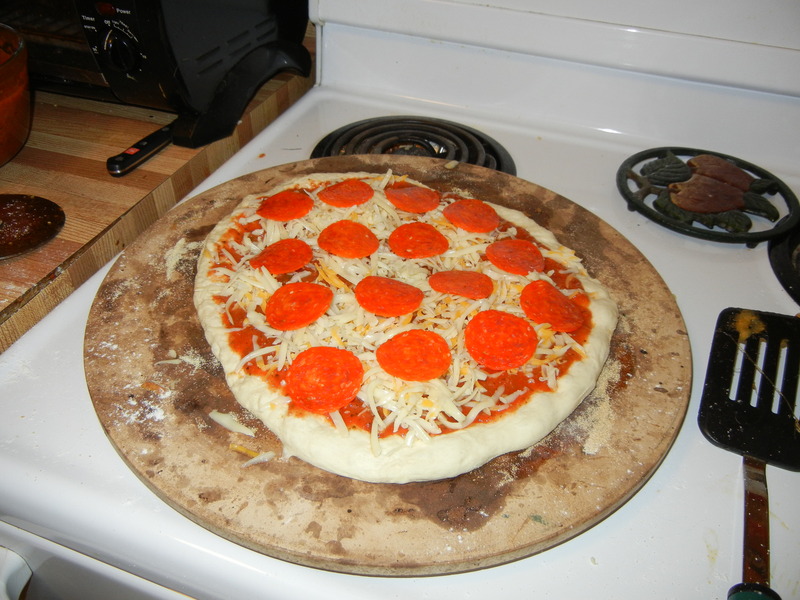 Using the back of a soup ladle, add a SMALL amount of pizza sauce to the prepared pizza dough base and spread to cover the entire base minus the crust barrier. I would recommend a scant ladle-ful for an individual size pizza, up to two ladles for a larger pizza base. 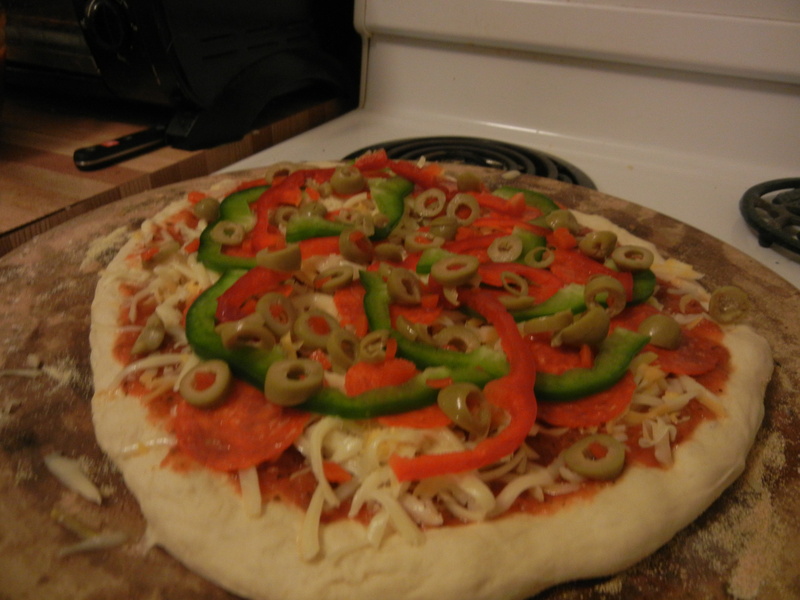 Remember, the more sauce you add, the soggier your pizza will be and the longer it will take to cook through. From this point onwards, you can add whatever the frell you want to your Custom Pizza Creation (see below for suggestions). When you have added your toppings, bung the pizza into the oven on the middle rack and let it cook away (clock in at 10 minutes for small individual pizzas, and 15 minutes for larger ones), then start watching it like a HAWK every 2 minutes thereafter, until it reaches the level of doneness that you prefer. You will be able to tell it’s done through by a few methods: the cheese on the top will be bubbly and browning, the crust edges will be golden, and the heavenly aromas will make you want to risk 2nd degree burns just to have the melty cheesy goodness in your mouth-hole like WHOA. Here are some topping suggestions; this is by no means a comprehensive list, but a good place to start. Just keep in mind the following: 1) the larger the pieces on the pizza the longer they will take to cook, 2) unevenly-sized toppings will cook/brown/burn at different rates, 3) the wetter the topping is, the soggier it will make your pizza and the longer it will take to cook, 4) the more toppings you put on your pizza the soggier your pizza and therefore the longer it will take to cook. Protip: DO NOT USE BEGGIN’ STRIPS. They are NOT PEOPLE FOOD. Glad to have cleared that up for you. Note: real hearts are not recommended. Makes the pizza too, um, bloody. I don’t recommend cream cheese or cottage cheese, but if you insist, take pictures of you eating your pizza and send them to me! I do love a good horror story! Pro Tip: not real meat does not cook/brown/act like real meat; keep a VERY hairy eyeball on your vegan/vegetarian pizza-like substance, and don’t come crying to me if it tastes like the tears of a thousand dirty hippies. Cheese on top, cheese underneath, or no cheese at all, the choices are virtually endless. You can even make a sweet dessert pizza if you’re so inclined! Just replace the pizza sauce with an equal amount of Nutella, strawberry or raspberry jam, or even a favourite flavour of pie filling, and sprinkle on anything sweet that sounds nice together. Enjoy your PIZZA AWESOMENESS and make sure to BRAG TO EVERYBODY YOU KNOW that you are THE NEWEST CITIZEN of PIZZATOWN! Next Post …A flame about *this* high?